What is common between a baby and a New Year resolution? They are fun to make but hard to maintain. We all start to list down resolutions for New Year but hardly achieve them because most of the time they are unrealistic. 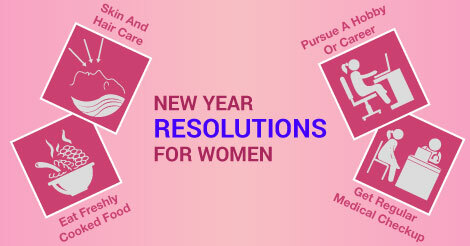 Here is a list of some simple and achievable New Year resolutions, especially for Indian women, who generally loses touch to herself in the hustle bustle of responsibilities. It is very obvious that you will commit yourself to losing weight but have you ever thought about your skin and hair and those uncanny dark circles. Stop skipping the very necessary skin moisturizer and hair oil massage because you are loaded with family responsibilities. Make a routine for hair massage at least every week and a facial every month. Find out whether vitamin B12 and vitamin D deficiency are the culprits behind your dark circles and dry skin and treat yourself accordingly. Visiting a dermatologist is always a good idea. Stop eating the leftovers while you serve freshly cooked food to your family members. You are equally important and valuable. Leftover food which is heated multiple times loses all its nutrient and serves you only with empty calories. Sitting will never take you anywhere. Switch off those mindless TV soaps and pursue a hobby. Enroll yourself to some hobby center or if you like a NGO. Freelancing can be a very good option for the mothers who do not get a chance to go outside for work. Majority of Indian women suffers from vitamin B12 and vitamin D deficiency. Anemia, low bone density, and high cholesterol levels are also very common. Get all your tests done and do not forget to visit a doctor if your reports are not okay. Women above the age of 35 must ensure to take Pap smear test and breast mammography. Always remember that you are backbone to your family and anchor for your child’s beautiful future. Take care of the mother and wife in you and pamper her a bit.